There are an increasing number of studies showing how plants have a much greater range of abilities than we realise. We tend to think that because they don’t have neurones and don’t seem to have even the most rudimentary brains, that they won’t be able to perceive, think, remember or imagine……ok, maybe I’m pushing this idea to its limit, but look at this recent study of how Berberis plants deal with infestations by parasites. 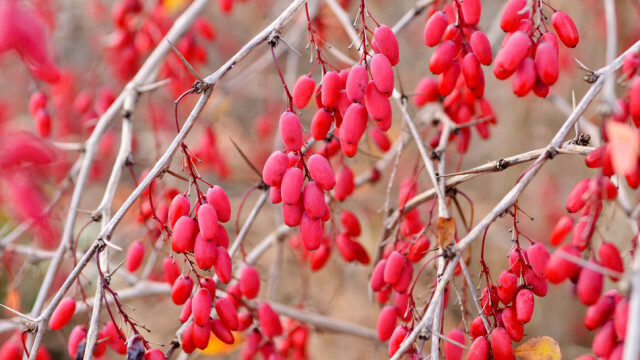 The Berberis berries can be infected by a species of fruit fly which injects its larvae into the plant’s fruit. Most of the berries have two seeds in them. To prevent the larvae from feasting on the second seed, the plant can “abort” that seed, resulting in the death of the parasite. A surprising strategy for a plant! But in fact, the plant is even more clever than this makes it seem. Not only has it “learned” how to prevent further parasitic infestation, but it can actually selectively “choose” to abort a seed depending on the chances of the parasite dying off…. If the Barberry aborts a fruit with only one infested seed, then the entire fruit would be lost. Instead it appears to ‘speculate’ that the larva could die naturally, which is a possibility. Slight chances are better than none at all. This anticipative behaviour, whereby anticipated losses and outer conditions are weighed up, very much surprised us. [say the researchers] The message of our study is therefore that plant intelligence is entering the realms of ecological possibility.” The Barberry, it would appear, has evolved a strategy where it’s able to adaptively and selectively abort its own seeds to prevent parasitic infestation. It’s considered the first ecological evidence of such complex behavior in plants, showing that they’re capable of structural memory, the ability to discern between inner and outer conditions, and anticipate future risks. Mind blowing stuff, I am so glad you have the time and energy for all this reafing Dr Bob! As a practising Christian Scientist I am not too surprised about the plant revelation (no pun intended) Personally, accepting all of creation is of one power of infinite Good, it seems plausible that to express the creator is almost obligatory. I guess humans have the option not to lol!